Hazelnut is not just a flavor you enjoy in your coffee or frozen beverage. It's a nut that actually has tremendous benefits that can be applied to many areas of your body. A very impressive nut that has copious amounts of healthy fats, proteins and vitamins, this is a nut that goes much further than being a great snack or a tasty flavor enhancer. 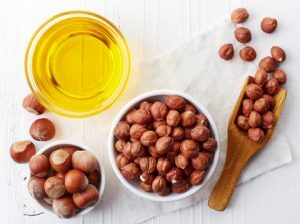 There are many ways that hazelnut oil can be used to improve your health, skin and hair. Here are a few key ways that the oil can be used. If you've been paying attention to the exploration and dissection of many oils and their various advantages then you know just how crucial vitamin E oil is to the skin. It's often even referred to as the skin vitamin because of how impactful it is. Well, this nut doesn't disappoint on that front because an entire cup of hazelnuts is roughly 86% of the daily requirement of the vitamin. It packs a big punch and as such helps to prevent wrinkles and other signs of aging. If you are worried how your skin is beginning to appear, try adding a bit of hazelnut oil to your daily skin care products. Many people don't understand why or how to properly use oils to help combat oily skin. They believe that oil should be kept away from skin that has the propensity to be naturally oily for fear that it will make it worse instead of improve it. Hazelnut oil is both incredibly hydrating and moisturizing while also helping to balance out the oils that naturally occur on the face. Oil isn't going to make your skin more oily by default. In many cases, skin that suffers from an overproduction of oil is often lacking the proper moisture which is why excess oil is occurring. For those who regularly color their hair, it can be hard to find specific items that aren't harsh and don't strip the hair of its various coloring agents. Hazelnut oil is so soft and gentle that it won't cause undue strain or damage to the color of your hair. In fact, its protein and fat content will help to protect the color and additionally condition it further. You can use a couple of drops in your shampoo regularly or use it in a deep conditioning mixture that you add to your hair once a week. It's not just beauty boosts that hazelnut oil provides. It can also do some important and necessary work within the body as well. Due to the unsaturated fat content within the nuts, consumption of this oil can help to boost healthy cholesterol levels while diminishing harmful cholesterol levels. Hazelnuts are also high in magnesium, which is a component that plays a major role in heart health. Magnesium helps to safeguard your heart from being overworked and overtaxed by ensuring it rest so that it isn't under massive amounts of strain. You can purchase hazelnut oil online from several companies at amazon.com.